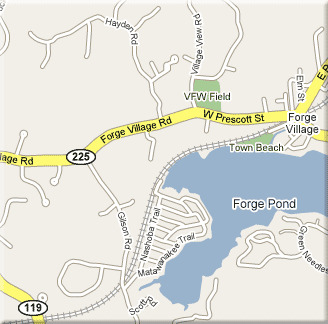 Take Main Street to Forge Village Road. Forge Village Road becomes Pine Street. Because the bridge is out, turn right onto Town Farm Road. Go to the end. Take a left onto North Street. Go through Forge Village. VFW field is on your right. From Rte. 40, head toward Groton. Take a left onto North Street. Follow approx. 3.5 miles to Forge Village. (You will pass St. Catherine's church and the Norman E. Day School.) Go through the village store area. VFW field is a half mile on your right.